My Apple IIc, such as it is. No box or anything, but then I didn’t care about such things when I got this. It’s a bit worse for wear these days, though I keep it around for the sentimental value – this was the first computer I owned, and yes, this is the original one I’ve always had. My mom bought it for me the year it came out (1984), in order to help me with my schoolwork. I’d wanted a computer for a while – several of my friends had them – but back then this was really a major purchase for any family. PC’s were not a dime a dozen like they are now, not many people had them or understood why you’d even want one, and they were expensive. I almost got a C64 just because my parents wanted to save some money. But I lobbied for an Apple II, because even as young as I was I had a pragmatic sense of these things. I wanted a system that had a lot of software available, was fairly powerful, could play some good games but also was a “serious” and respectable machine. I also wanted a machine compatible with what my school had in their new computer lab. The IIc was the latest version and had more memory than a stock Apple IIe, it had all of the most popular expansion options already built-in, and it was smaller. To my parents, it had the added benefit of costing less too. So it was a no-brainer. Apple in those days had a different image than they do now. 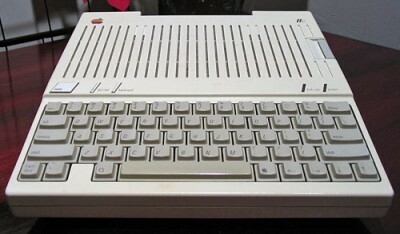 The IIc was actually the first machine that Steve Jobs really had a hand in designing, but the II line was not his line. It was Steve Wozniak’s line, and while the first Mac was already on the market when I got my IIc, it was known then as a business machine for companies who wanted to save money vs. buying and training people to use IBM PC’s. 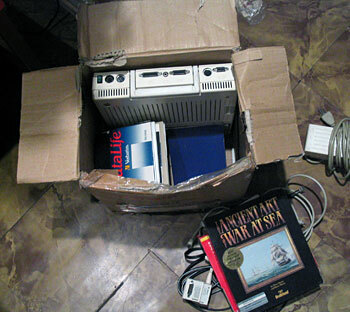 The II line was still Apple’s bread-and-butter line, and it was the top-selling line of computers at that time. All of the best games were released for it, along with popular productivity applications, and it had a huge freeware/shareware community. 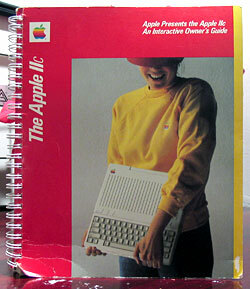 Later on, with the IIgs, Apple would begin trying to actively attract the creative types that they’re known for today. 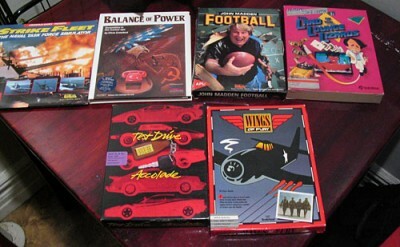 But when I got my computer, they were still very much a mass-market PC company (or at least as mass-market as PC companies got in those days), and they were known as much for the games you could play on the II line than for anything else. I used my IIc for close to ten years. I really did get a lot of use out of it, and I still love the whole II line. I have no affinity whatsoever to the Mac – the Mac is not Apple to me – but I love the II. I still have all of my original accessories as well, though not with me here (they’re in storage) – including a 1200 baud modem, a Kraft joystick, and the 9″ green Apple monitor with matching stand. 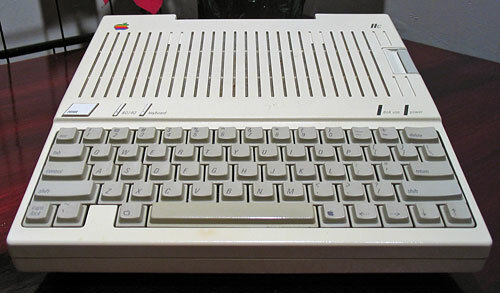 My Apple IIc is unfortunately yellowing with age, and its keyboard is completely worn out. It’s almost unusable. Which is a shame, because this computer had a really great keyboard when it was new – in 1984, it was the only computer other than the IBM PC to offer tactile feedback. It wasn’t quite as heavy-duty as the IBM Model M keyboard (I use one of these today), but it was still much nicer than most home computers of that time. There’s a stack of like 200 5 1/4″ floppy disks down there. By the way, that’s the box for Ancient Art of War at Sea, but the game itself doesn’t work anymore. Those floppies were not very tough. About a third of my disks no longer work – it’s actually more surprising to me that the remaining two thirds do. A little frayed around the edges but I guarantee there aren’t many of these floating around anymore! Lots of cool pics and info in this book. These days, I can appreciate the gaming capability of Apple’s competitors at the time – the C64 and the Atari XL line, especially. In fact, the Apple II line was the weakest of all home PC’s in terms of gaming – it had the poorest graphics and sound of all the home machines. But I didn’t get this computer just for gaming, and regardless of its gaming power, it still had the most titles available for it. So I never regretted pushing for this machine, and I almost feel a sense of gratitude towards it for really turning me on to computers in general. I don’t think I’d be working as an online producer now (my day job!) if it wasn’t for my Apple II.